Raise or Fold: A Year of Risky Business: Do The Eyes Have It? Interesting post here, as I've been trying to pinpoint why I feel that I play so horribly at cash games when I have friends at the same table (and why I've now put myself on a ban from playing at the same cash table with someone who is in my cell phone unless it's a special occasion). A special occasion would have to include when you are OTB in Badugi, cap it and draw three. ;) Those are always special games. But I digress, Cardgrrl, I know exactly where you are coming from. Though I am completely comfortable with blocking my friends out to concentrate on the game I may have a different opinion if my friends were not poker players; and thus lacked the understanding of the need to focus and concentrate. 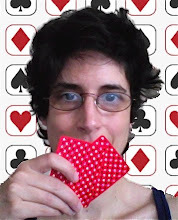 Fortunately (or unfortunately, depending on how you look at it), all of my friends and family are poker players, so I was not put into the awkward situation of feeling the need to juggle being a "host" with the need to concentrate on the tournament. This really applies to tournaents only. I could not tolerate someone perma-sweating my cash game. That would irritate me. I like being in my own little world when playing cash, and that does not include a non-playing sweater. However, playing at the same table with friends is a slightly different story. I have no problem playing friends hard, and exploiting any possible weaknesses that I know they have. I expect my friends to do the same. Interesting and enjoyable blog post as always. We'll miss ya tomorrow night at the HORSE game! Also, you told me in person another interesting fact, which I think you will not mind me sharing with your readers (and if you do, well, just delete this part, or reject the whole comment! ): You found at the WSOP that when one of your friends was watching the table as a reporter for PokerNews (specifically, Shamus and F-Train), that did not produce the same distraction as it would if the same person were standing in the same spot just to be watching/supporting you. Something about knowing that they were there to do a job rather than to be railing you specifically seemed to change your internal reaction to their presence. Again, because that is so different from my experience, I thought it was really interesting. Well, you take pride -- am sure rightfully -- in your concentration. So, I imagine you can add ignoring friends to your game. All you have to do is tell them you will be doing that. You can do it by making fun of your one-track mind that won't multi-task. Add that it is at times a real challenge to walk and chew gum. They should be understanding and not offended. I envy that concentration. I used to have it online. But, too many tournaments gave me what I call my boredom tilt. I can only keep it together for the 3-4 hours by doing them on an occasional basis these days. @Rakewell: When a friend is playing at a table with me, then they are AT THE TABLE and therefore they are no longer a distraction—they are part of the world I'm paying minute attention to. The only time that might be problematic would be if there were some extra-game consideration that would cause me to not want to play my best competitive strategy against a friend. In that case, I would do my best to avoid the situation in the first place (probably by not playing at all). @KenP: Alas, the "ignore your friends" thing just doesn't work like that for me. It has nothing to do with the friends' expectations, and much more to do with my own wiring. I'm not worried about my friends being hurt because I ignore them while playing; that's not the problem. (They get the need to concentrate.) The problem is that while my overt behavior looks like "ignoring," in my head there's not so much ignoring going on. When I wrote about friends possibly being offended, it was in the context of ME not wanting to rail THEM.